Those tough old New Englanders survived their long cold winters fortified by a daily tonic of apple cider vinegar and honey. I have been hearing about Fire Cider for months. Now that I am surrounded by coughs, sniffles and flu – I have become a convert to the updated version of this old fashioned tonic. So far, so healthy! Herbalist lore attributes the name ‘fire cider’ and the popularization of this tonic to Rosemary Gladstar in the Sonoma Valley way back in the 1970’s. Since then, cooks have created variations on her original recipe. I will include some DIY recipes below, but they require ‘steeping’ your tonic for weeks. 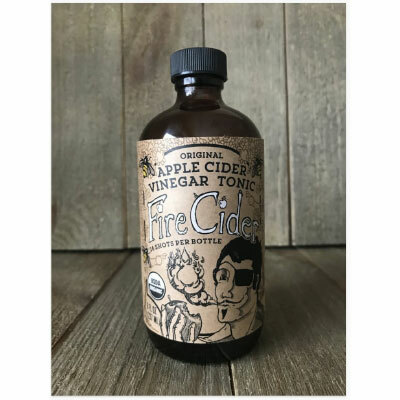 The easiest way to try Fire Cider is to ask for a shot at a juice bar or buy one of the several brews available in bottles. Cayenne Pepper stimulates circulation and gets your immune system going. Cinnamon is said to lower blood sugar, improve digestion and immunity. Horseradish is said to end headaches and clear sinuses. Ginger is good for circulation and digestion and combats an upset tummy. Onions are similar to garlic. Turmeric is said to be anti-inflammatory and anti-oxidant. Raw Organic Apple Cider Vinegar promotes digestion and feeds the right ‘stuff’ in your biome. Raw Organic Honey is an energy booster with vitamin C, iron and calcium and it is said to be anti-oxidant. Honey is delicious and soothing and makes the fiery ingredients palatable. My friend (not a medical professional) swears by a ‘wellness shot’ of a tablespoon to an ounce of Fire Cider first thing in the morning to get his immune system going. A second tablespoon later in the day just acts like a booster. Rosemary Gladstar suggests taking a tablespoon at the first sign of a cold, then another every 3 to four hours. It is also an alcohol-free digestif after a heavy meal. You can put it into a cup of tea. Use it as a substitute for vinegar in salad dressing and drizzle it on vegetables. Use it as a marinade and add a spoonful to soup to punch up the flavor. A healthy Bloody Mary? Obviously if you have health issues – ask your doctor. You can add it to still or sparkling water or to juice. Try an evening dose in a hot toddy. I take this Fire Cider and I have grown to like it. 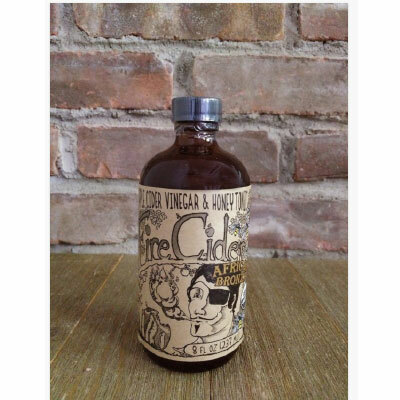 Fire Cider – Organic Apple Cider Vinegar and Honey Tonic. 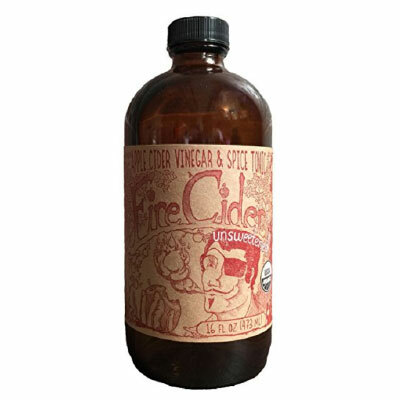 This is the original and most popular Fire Cider that Shire City Herbals makes. They are in Pittsfield, MA, the heart of New England. Eight ounces, $15 plus shipping. Unsweetened Organic Fire Cider from Shire. Personally, I can’t imagine drinking the ‘fire’ without the honey, but people clearly like it. Maybe they add their own local raw honey. Sixteen fluid ounces for $24.41 plus $6.55 shipping. 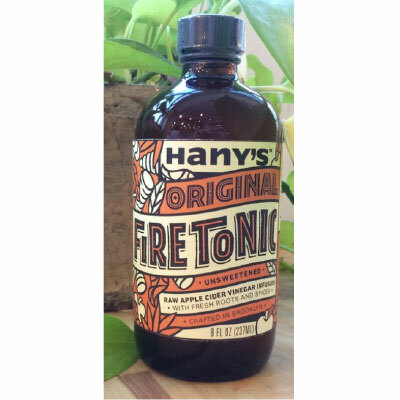 Hany’s Original Firetonic is made in Brooklyn and gets great reviews. It is unsweetened. You need to add your own honey or do without. Eight ounces for $15 plus shipping. This African Bronze Fire Cider includes Organic Fair Trade African Bronze Honey which supports indigenous Zambian beekeepers. The honey is dark and micro-nutrient and antioxidant rich. Eight Ounces for $16. Feeling adventurous? Hany’s offers this selection of eight ounce bottles of each of their Fire Tonics – Original, Reaper, Nectar and Harvest for $55 plus shipping. 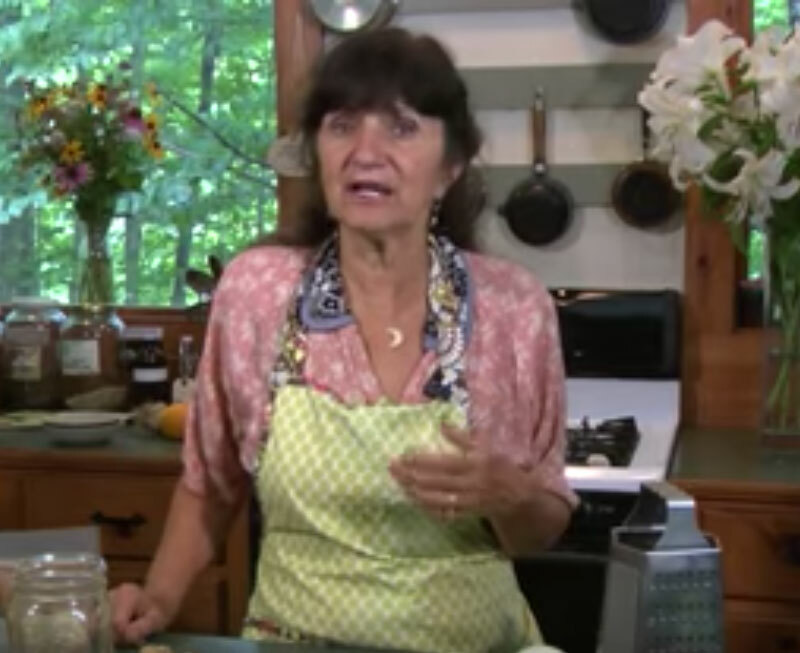 Rosemary Gladstar, the herbalist who has popularized fire cider, shows how to make it in this twelve minute YouTube. Put ginger, horseradish, onion, garlic, peppers, lemon zest, lemon juice, rosemary and turmeric in a quart canning jar. Cover with apple cider vinegar by about two inches. Use a piece of natural parchment paper or wax paper under the lid to keep the vinegar from touching the metal. Shake well. Store in a dark, cool place for one month and shake daily. 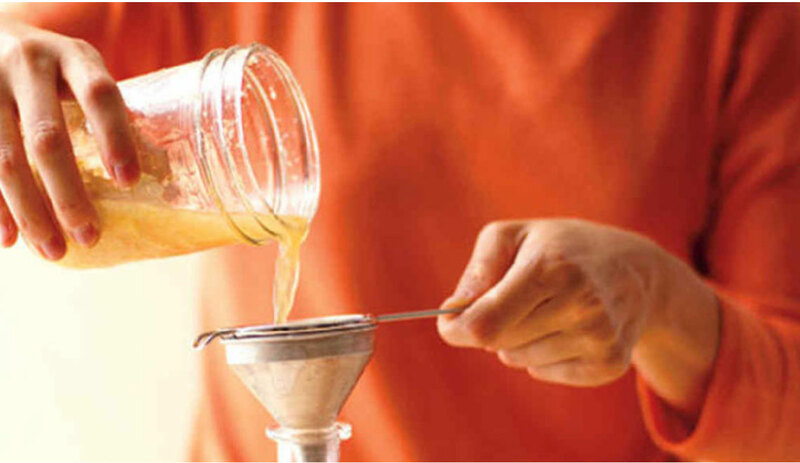 After one month, use cheesecloth to strain out the pulp, pouring the vinegar into a clean jar. Be sure to squeeze as much of the liquid goodness as you can from the pulp while straining. Add ¼ cup of honey and stir until incorporated. Taste your cider and add another ¼ cup until you reach desired sweetness. Fire cider should taste hot, spicy and sweet. It is great as a winter time tonic and as a remedy for colds and coughs. Often people use it as salad dressing, on rice, or with steamed vegetables. In a clear sign that Fire Cider has become main stream – here is Martha Stewart’s recipe. Place ginger and horseradish in the bottom of a 1-quart Ball jar or similar re-sealable glass container. Add garlic, rosemary, chilies, peppercorns, cinnamon, and onion; then add lemon and orange pieces, pressing down to firmly pack ingredients in. Add vinegar, adding more as necessary to fully submerge ingredients and fill jar. Seal jar (if using a metal lid, place a piece of parchment between jar and lid to prevent a corrosive reaction with vinegar). Store in a cool, dark place, shaking for a few seconds every day or two, at least 3 weeks and up to 6 weeks. 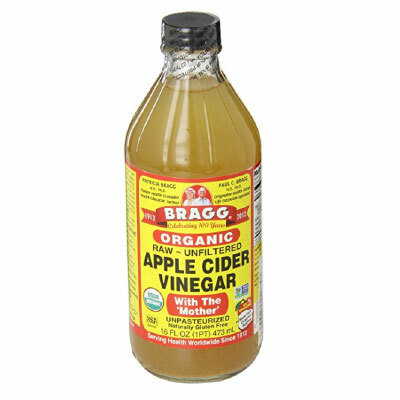 In case you need good apple cider vinegar, try Bragg Organic Unfiltered Apple Cider Vinegar, Raw, 16 Ounce for $8.40. Check out these related ASE articles. What To Do With All Those Fireplace Ashes? Showing Affection on February 14th.